It’s been a while since our last Songs of Our Families blog post so thought I’d write a quick note to tell you what the choir has been up to. Bulgarian Voices of Seattle’s 2013-14 season got off to a great start on September 25th with three new singers and many former members so we are up to 30 singers. During the first weeks of rehearsal we worked on musicianship (scales, pitch, breathing, rhythm, blend, etc) and had a lot of fun learning new repertoire for various performances. 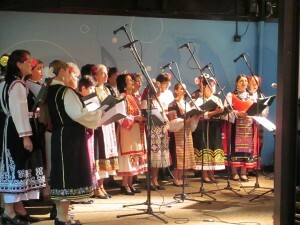 Over the summer several of the singers were in Bulgaria and brought back costumes. Baba Penka is now wearing an apron that her great grandmother made. The choir continues to be a great joy for all of us, as our friendships continue to grow stronger and we share the music, and life’s joys and challenges together. The singers’ research into songs their families remember is going very well. The choir has already performed one of several songs we learned from Mimi’s family and there are more in the pipeline from other singers’ families. The process of this research has inspired family stories, recipes, memories and more. The families back in Bulgaria are touched that their songs are being sung so far away. It proves to be an enriching experience on both sides. Over the summer we had two recording sessions with Baba Penka Encheva and friends at Jack Straw Productions. 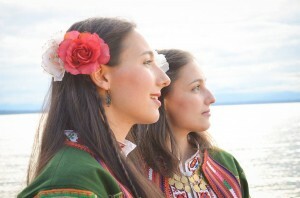 She sang a duet with Dunava’s Jody Rush and another with her daughter Zlatina who is a member of Bulgarian Voices. (I love these mother-daughter sets in the choir.) Penka also recorded a song with David Bilides on tambura and another with him on kaval. Michael Lawson accompanied Penka for several songs on accordion. Aleksandr Eppler also graced the studio with his kaval. In January, Vladimir and Hristo Mollov will come to Seattle for Penka’s final recording session. In late winter / early spring the entire choir will record a couple songs for the CD after which the project will move into editing, mastering and production. 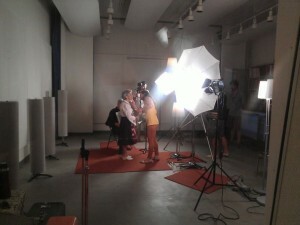 Filmmaker Bogdan Darev and his talented crew have completed filming. There were some amazing photos from these shoots, too. It was a great and new experience for choir members, and a very busy summer for Penka and Zlatina’s family between the recording and filming. The culmination of the Songs of Our Families project will be a full-length afternoon concert on May 10 at Carco Theater in Renton. The Tazi Baba / This Baba documentary film by Bogdan Darev will be premiered and the choir will share songs collected in their research.